CNC Wire EDM (Electrical Discharge Machining) is commonly used when low residual stresses are desired, because it does not require high cutting forces. Common processes wire EDM provides are Slots, eyelets cut-offs and grooves. CNC Wire EDM utilizes a fine, electrically charged metal wire usually made of brass, to cut through the work piece while submerged in a tank of deionized water. The moving wire erodes any conductive material that is within .0005” of its path, while the deionized water cools and flushes away debris from the cut. The wire is constantly fed from a spool and is held between upper and lower diamond guides. The guides are CNC-controlled and move in the x–y plane, and the upper guide can also move independently in the z–u–v axis, giving the ability to cut tapered and transitioning shapes (e.g., circle on the bottom, square at the top). With multiple axis movement capability, CNC Wire EDM can be programmed to cut very intricate and delicate shapes. 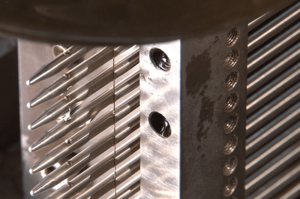 At Marshall, CNC Wire EDM is often used when a machined feature, such as a slot or eyelet is required within a fragile portion of a component. Unlike an end mill or cutting tool, the Wire EDM process does not introduce cutting pressure or vibration. This is also valuable when medical device components need to be held to critical tolerances. When appropriate, building a fixture that will stack as many as 15 parts in a CNC Wire EDM operation is a common manufacturing practice utilized by Marshall. At Marshall CNC Wire EDM is used in production for generating slots, grooves, holes, cutoff and other features.